schuetzdesign: Wanna hear what they say in the Conde Nast building lifts? Wanna hear what they say in the Conde Nast building lifts? 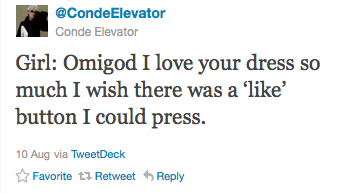 My new favourite Twitter feed, is a record of conversations quoted from the lifts of the Conde Nast building in New York. Gotta love it! Even quotes from Anna Wintour!